Several years ago, I noticed a sponsored advertisement on Facebook titled Insider Tells All. It was an advertisement about a book written by a very successful network marketer, Mike Demetro. He talked about his struggles and failures in network marketing until he figured out a system to be a sponsoring machine. 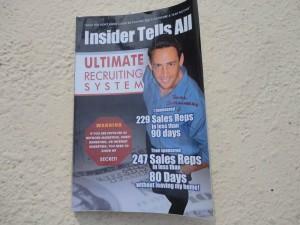 He wrote the book Insider Tells All to reveal his exact system for building a successful network marketing business. I don’t know why I didn’t buy the book the first time I saw the ad on Facebook. I should have. I actually waited about three years to buy it! A couple of weeks ago I read a blog post where someone talked about what they learned from the book and how much they enjoyed it! So what did I do? I went and ordered a copy! I finished reading it for the first time last week and I am re-reading it again right now. It is easily one of the top ten network marketing books I have ever read, probably in the top five. Don’t take that lightly. I’ve read most of the books available in our industry and this book is a true masterpiece. I give this book a 10 of 10. It’s epic, if you take the information Mike teaches and actually apply it in your network marketing business. Mike Demetro shares step-by-step instructions that anyone can follow to be successful in our industry. His advice is bold and not for the feint at heart. But, if you are serious about our industry and REALLY want to make it big in your company, this is the book for you. What I want to do in the paragraphs below is share some of my favorite quotes from Insider Tells All. Each quote is in bold and italics. At the end of each quote I will also provide my own two cents on it. The quotes are listed in no particular order. Enjoy. # 1 Entrepreneur Magazine says that 97% of people who start a home business will fail if they do not have a marketing system in place. Marketing and lead generation are the lifeblood in every business. All businesses need fresh leads and prospects. It’s foolish to think you can just open your business and expect customers to come flooding in. Without a good marketing campaign, most businesses are doomed, even if they have a great product or service. # 2 Having just 5 or 10 people in your downline, trained to make massive exposures (which this book teaches), is the very thing capable of delivering an income of $20,000 or $30,000 per month! I’ve found that five is the magic number in network marketing. Five key leaders can make you very wealthy in network marketing. Ultimately, that’s what you are looking for: leaders. Of course, you will probably need to recruit 100 to 500 people to find five serious people. # 3 Network marketing or multi-level marketing is absolutely the best chance for the average person to create an above average income, and in some cases, a multi-million dollar distribution right from the comfort of his own home. The average person can’t afford to start a traditional business, nor do they want to. This is the only business model I know of that lets you work from home, not need employees, and create residual income, without investing much capital. It’s certainly not for everyone, but it’s a great opportunity for anyone with an open mind and strong work ethic. # 4 Training is the key to your success. When you get involved in network marketing, you have to go back to school, to MLM School. Just like any job or new profession, there will be a training period, especially if you don’t have sales, marketing, leadership or business experience. During this training period you will need to learn the ropes and develop a new skill-set. For most people, it will probably take them one to three years to really master their network marketing skills. # 5 Your success will come down to the amount of exposures you make on a daily basis. Exposures is the magic word in network marketing. The more people you share your products and business opportunity with, the faster your team will grow. PERIOD. The people with the biggest teams are the people who have approached the most amount of people and received the most amount of NOs. If you aren’t exposing your products or business to at least five to ten new people each day, your business will never take off. # 6 You’re not selling, you’re really sorting. This is a business of sifting and sorting. Your job is to work the numbers and then work with the willing. It’s not your job to pressure or convince anyone to join. If you have to convince someone to join you will have to convince them to stick with it! On a side note, I disagree with Mike that this industry is not selling. If anything, you must be able to sell yourself. # 7 The top money earners in network marketing companies are simply the people who make the most exposures on a daily basis. Once you really understand this, you will have what it takes to become a top earner. You just have to be willing to make more exposures than anyone else will. Make it a goal to talk to 10-30 people a day, every day, and it will be impossible to fail. # 8 Don’t let the company pick you. Pick the company that’s best for you. This is vitally important. Most people don’t pick their first company, the company picks them. Make sure you team up with a company you can get excited about. Ideally, you want a company with a product line you are passionate about. Learn how to find the right MLM Company. # 9 A product is actually the foundation of your business opportunity. The products are extremely important. If the products don’t make sense, neither will the business. All successful businesses in our industry are built on a solid product line! The products must be in mass demand, priced competitively, and provide a great value, even at the suggested retail price. # 10 When choosing a product, the first thing you must do is find a product you are passionate about. It’s hard to sell a product you aren’t passionate about yourself. Team up with a company and product line that excites you. That way, when you speak with prospects your enthusiasm will shine through. # 11 Leads can literally make or break your career in network marketing. Leads are the lifeblood of your business. Having leads lets you make massive exposures. It’s the person who masters prospecting and lead generation that typically does the best in our industry. Show me someone who can generate leads on demand and I will show you someone who is making money and having fun with their business. # 12 This business is not a hobby. Most people do not treat their network marketing business like a real business. You get out what you put in. If you want to make the big bucks, you must make a big commitment and do what most people aren’t willing to do. Plan your work, work your plan, stay the course and act as if you have one million dollars invested in your network marketing business. Do that and there is no doubt in my mind you will one day be up on stage. Treat it like a hobby and you will lose money! # 13 Don’t forget you are looking for customers as well as new people to join your business. All businesses need customers. Network marketing is no different. If you are only trying to recruit distributors you are really missing the boat. More people will be interested in the products than the business opportunity. For every distributor on your team, there should be AT LEAST five to ten retail customers. # 14 You need to talk to 20 people a day. This sounds difficult at first, but just about anyone can set aside two hours a day to contact 20 people a day. Talk to just 20 people a day for one year and you would talk with 7,300 people. Even if you just sponsored one in 100 people, you would have recruited 73 people in a year. If you improve your closing and follow-up skills, I am 100 percent sure you would recruit at least double that amount. # 15 If five distributors in your business each make 20 exposures a day, that’s 100 calls a day being made to help build their business and YOURS. The power of this business model is the leverage you get from other people on your team. It’s about a lot of people each doing a little bit, and a few superstars each doing a lot. # 16 You will quickly discover that it is easier to talk to strangers than it is to friends and family about a business opportunity. Family and friends are typically your biggest critics. It’s hard to be a prophet in your own land. Most people struggle to sign up people that they know. # 17 When it comes to leads, I believe in quantity versus quality when buying them. The more leads you have to talk to the better. At the end of the day, you never really know who will be interested and who won’t be interested. Paying more money per lead does not guarantee you success or a higher closing rate. # 18 I firmly believe that a good script (what you will say to these people) can conquer all. You need to know what to say when you talk to people. Come up with a good script and practice it until you have it memorized. # 19 There are unlimited people out there who are ready and able to join your business. They will even call you! There are over 350 million people in America alone and close to 7 BILLION people worldwide. A lot of folks are looking for a new way to make an extra income. All you have to do is introduce them to your business, and let them decide if it is a good fit for them. # 20 It all comes down to exposures, leads, and TRAINING! These are the three magic words in network marketing. You need training so you know what you are doing. You need leads so you have people to talk to and you need to expose the business to as many people as possible, so you can find the right people to partner up with you. # 21 When contacting people, he quickly realized that there was no faster way to go than the telephone. The phone is your best friend. It does not weigh 300 pounds. Using the phone is the fastest way to grow your team. You could talk to more people on the phone in one hour than you could face to face in a week. Just remember that the purpose of your phone call is to set the appointment, not to explain the business. # 22 The best advice I can give you is that you have to treat your network marketing business as if you had to take a second mortgage out on your home to get your business started. Unless your business is a big priority, there’s a good chance you will never build it big. You need a sense of urgency. You should act as if you have one million dollars invested in your business. # 23 I realized how important a good script and massive exposures are to any business. This applies to any type of business, not just network marketing. Once you know what to say, all you have to do is work the numbers. # 24 Marketing and sales is a step by step process. You need to have a process to walk people through from start to finish. Most people will not join or buy the first time you talk to them. You need a series of steps and exposures before they will be ready to join. # 25 Your goal is to sign up no less than 30 people in the next 60 days. Think about this. The average telemarketer needs to create 20 sales every week just to keep from being fired. You only have to do it ONCE! Your goal is to create momentum and get your initial group of distributors sponsored quickly, so you can help them do what you did. The best way to get started is to start fast! # 26 The bad news is there really is no way to put a number on how many people you have to recruit to get your own network marketing business established and growing on its own. Everyone has a different number. Your number might be 50. It might be 100. It might be 200. It might be 500. You have to sponsor enough people until you find your leaders. You never know where or when you will find them. You can reduce this number by focusing on quality prospects. # 27 Stop looking for a big hitter and become one. Be the type of person that you want to sponsor. You attract what you are, not what you want. If you become successful yourself, you will naturally attract the right people. # 28 The truth is that the referral marketing approach is not fun, easy, or glamorous, but it is very effective. Getting referrals from people you know and people you meet is one of the best ways to build your business. Create a good referral program and ask everyone you talk to for the names of the sharpest people they know. # 29 It is much easier to approach someone with a business opportunity when you have the name of the person who referred her to you. This goes hand in hand with the previous quote. It’s much easier to call someone when someone else referred you to them. This gives you an “in” and is a great ice breaker. # 30 If your new recruit is willing to give you 3 or 4 referrals, but doesn’t want to be on the phone when you call them, DO NOT LET THIS STOP YOU! This should be common sense. Don’t let your new team members keep you from being successful. If they give you people to call, call them. If you sign those people up, put them under the person who gave you the names. # 31 If you have an ad that is running in newspapers or on the internet and it’s breaking even, that’s a winning campaign. Your entire goal in advertising is to find an ad that breaks even and then place that ad in as many different places as you can, so you can scale your efforts. In network marketing, if you can break even on the front end, you can build your fortune on the back end (repeat orders). # 32 When generating leads through advertising it could take you a few weeks or months before you find an ad campaign that will break even. You will have to experiment and tweak your ad before you find/create one that breaks even. This is known as testing. It might take you 10, 20, even 50 or more adjustments to find your winning ad. # 33 When advertising and writing ads, you will have ONE GOAL. That goal is to get a person to take the first step in a 3 or 4 step process. The purpose of an ad is to generate a lead. Then you need a game-plan or process to walk them through, so they can get the information they need to make an informed decision. # 34 When advertising, always lead with the money, then follow with the product. Most people are looking for more money, so this is a great type of ad to use, especially in the current economy. # 35 The most common mistake I see when people start to market their businesses is they try to accomplish one, two, or three steps all at one time. Your goal with your new prospects isn’t to try to get them to sign up right away. Instead, your goal is to get them to go through your entire recruiting process. If you walk people through your entire process, you will sign up more people. # 36 When advertising, you always want your ad to appeal to the largest market possible. Niche marketing can work well, but mass marketing has greater appeal because there are more prospects to choose from. Besides, just about everyone in the world is looking to make more money! # 37 One or two winning ads that allow you to break even could MAKE YOU RICH! Once you find a good ad that allows you to break even, or better, all you have to do is scale your efforts to become ultra successful. You can use a good ad for many years, in different marketing media. # 38 Always package THE TRUTH in the most powerful way you can when advertising! Never lie to your prospects. Be honest, but use creative words that appeal to people’s emotions. Realize that most people love HYPE. While I hate HYPE myself, and frown upon using it, I also know that exciting, hype based ads typically get the highest response. Why? Because most people want to get rich without doing any work! Create ads designed to attract the type of person you are looking to recruit. # 39 When advertising, your first goal is to collect the lead. The purpose of any advertising campaign is to generate a lead and then have a multi-step follow up process. Most people mess this up and simply advertise their business opportunity first. What you really want to do is advertise a free report, eBook, video or other information products that explains your business opportunity for you. # 40 The person who exposes her business to the most people on a daily basis wins. You’ve read this quote several times on this page. It is so true. You can think about your business all you want, but that won’t help you much. The only thing you get paid to do is retail and recruit. The only way to make that happen is by making exposures with new prospects every single day. If you haven’t read “Insider Tells All: Ultimate Recruiting System” by Mike Demetro, you are really missing out. This is easily one of the top 10 network marketing books I have ever read. If you would like to check it out, you can order a copy here! If you can’t find a copy on Amazon, you can visit his website here. I hope you will buy “Insider Tells All”, study the information and apply what you learn in your network marketing business. On a side note, if you’ve read the book before I would love to hear from you. Did you like the book? What was your biggest takeaway? Please leave a comment below to let me know what you think. I really want to read this book now! I really like the quote about finding a product you are passionate about. It is so much easier to sell something or at least get people interested in something if you are invested in it and actually believe in what you are selling. One of the other quotes that really stands strong in my mind is #38: Always package the Truth in the most powerful way when advertising. The key word here is truth. So many network marketers have a tendency to lie, or build the truth up bigger than it is. Example: You can make $5,000 a month by spending 1/2 hour a day. Yes, a person can probably make $5,000 a month, but 1/2 hour a day? No way! It takes much more than that to build a profitable business. If we tell the truth when advertising, we will gain trust and respect. Sure we may not get all the people we would have by lying, but did we want those people anyway? Mike has many wise words here. Like any business you have to put in a lot of work. I believe anyone could build their business in 30 to 60 minutes a day IF they do it every day and focus on the right activities while they are working. Point number 12 about this business not being a hobby is so pertinent. I think many people come into this business with the attitude that they can put in some small effort in their spare time and make massive amounts of money from it; NOT TRUE! You really have to invest in this business; your time, your money, and your energy in order to create something truly profitable. Otherwise, you are pretty much just wasting your time. It takes a lot of work and a lasting commitment to make it in this industry. This sounds like a great book Chuck. I am really excited about all he has to say about advertising. mike says that breaking even is good, and I always had thought that it should be making profit, but the way Mike puts it makes great sense. If it is breaking even, use it in many more placements, and you will make a profit from it. He speaks about leading with money in advertising. This is true; if you can explain in a simple ad how a person can save, or make money, they will contact you. I also like how he said that you have to give advertisements a chance. If they are not working, just slightly change them and keep track of the numbers. Yes, I would say this does sound like a great book that I need to read. Yes, it’s definitely a great book and worth reading.